This Christmas season enjoy the beauty and aroma of holiday candles. Enjoy the numerous benefits that candles provide. Scented candles are one of the most popular Christmas gift ideas for mum this season. More than a practical way to provide light, candles bring relaxation and romance to a room, adding to your mum’s home décor. 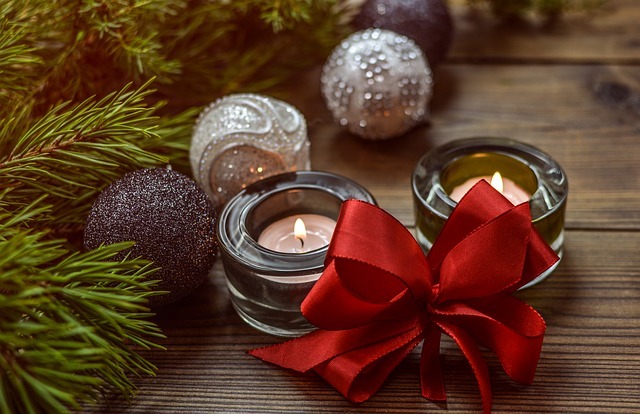 What are some of the ways that Christmas candles benefit your overall mood and health? Christmas candles in familiar scents like candy cane, gingerbread, and sugar cookies brings back fond holiday memories. Besides being pleasing to our olfactory glands, these comforting scents trigger pleasant neurological messaging, releasing feelings of happiness and joy. Find candles for less with popular online retailers during the holiday season. Some other popular scents for mum include evergreen, vanilla, and even chocolate. Does your mum seemed stressed, working hard to manage family and her job? Does she need a calming, relaxing atmosphere to come home to? Christmas candles provide a beautiful ambiance that creates a cozy home. The soft light gives her eyes a moment to rest from the harshness of the fluorescent lights or computer glare. Besides decorative holiday candles, invest in aromatherapy to foster relaxation. Our mums often burn the candle at both ends, working so hard to do their best that they forget the power of self-care and relaxation. Lighting candles produces a sense of calmness, reducing anxiety. Candles are often helpful for meditation and visualization exercises that minimize stress. Spend time with your mum doing yoga or tai chi in candlelight each day during the busy Christmas season and reap incredible health benefits. Nothing says it’s Christmas like a home brimming with beautiful holiday candles, evergreen wreaths, a towering Christmas tree, and shimmering ornaments. Candles extremely versatile. Place a small peppermint candle in the bathroom to add a nice seasonal touch and reduce odor. Line your fireplace mantle with a string of matching holiday candles. Purchase an extra-large vanilla candle in the family room and enjoy hours of pleasant relaxation even during the busyness of the season. Don’t just buy any candles this for your mum. Try to find candles that suit her individual taste. Is she elegant or is she a little quirky? Does she prefer a shabby chic or perhaps she enjoys vintage candles with traditional trim? This may go without saying, but a peppermint or gingerbread scented candle can cover a variety of unpleasant odors from children, pets, the bathroom, and garbage. Fill a bathroom with the powerful scent of peppermint or lace the bedroom with sugar cookie. There are numerous scents available at Christmas, some of which have cheerful names like Woodfire, Sparkling Cinnamon, Winter White, and Visions of Sugar Plums. Give the gift of good health and happiness this Christmas season when you give your mum a holiday candle. Let her enjoy the countless benefits to her overall well-being. Bring her joy and Christmas cheer. This entry was posted in Beauty and well-being, Gift Ideas, Health, Holidays, Home improvement, Occasion, Rest and Relaxation, Shopping and tagged candles, candles to boost good mood, Christmas gift ideas, holiday candles on November 2, 2018 by Yami.